Squash House Quilts: Applique Amazement in Oregon! In case you're wondering where I've been, Mr. Squash and I decided to make a run to the Oregon coast for a few days! I love being able to decide to go somewhere on the spur of the moment. We spent the first night in Hood River, Oregon at a 100 year old hotel in the heart of downtown. Other than a quirky floor plan and being close to the train tracks (difficult to avoid at any hotel there), we had a gorgeous view of the Columbia River and a lovely stay. From there we headed to McMinnville, where Vinnie was born! For those of you who haven't met Vinnie -- he is my Gammill longarm. I had a few questions about Vinnie for Jack Boersma, but Jack wasn't in the shop. Fortunately I spoke to their resident longarm expert (I'm so sorry I don't know your name) who was most helpful. After a bit we heard some commotion at the cutting table. 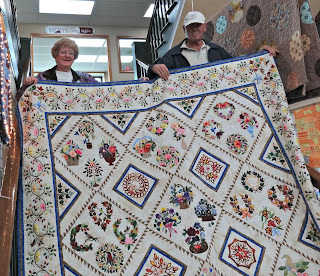 A woman and her husband had brought in some of her applique quilts and we were all just stunned by her work! Carol Hayes of Mulino, Orgeon, graciously allowed me to take photos of her works of art. 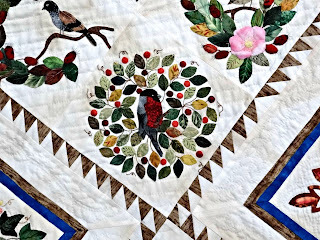 Here she is with her husband with her quilt Little Brown Bird from the book by Margaret Doucherty. My apologies to Carol's husband who didn't want to be in the photo - but you two were so cute together! Carol's husband was quite proud of her work, and rightly so! Click on the photos for a closer look! Carol did almost all of this using the needle turn applique method. She said when it got to the really, really tiny pieces she did use a bit of freezer paper here and there because the pieces were too small to turn. 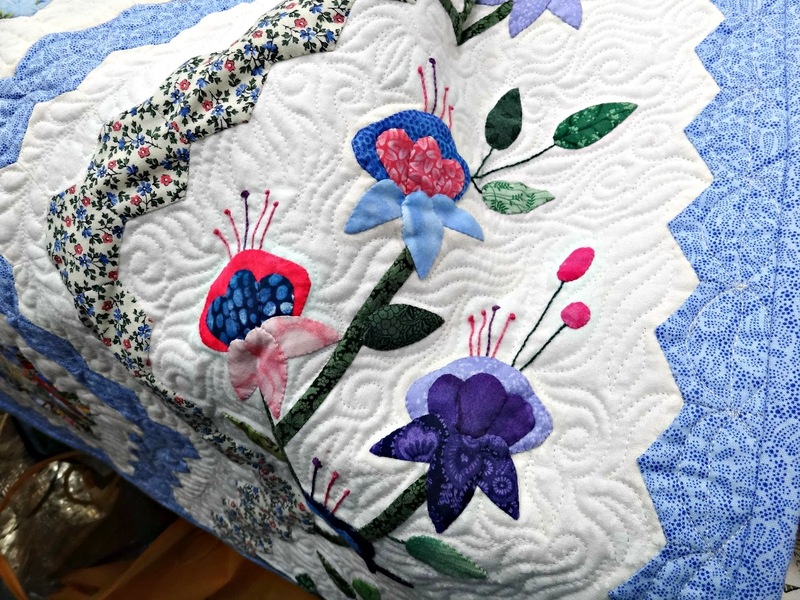 I believe this is entirely hand quilted, too! It took Carol 8 years to finish this quilt! Check out the mitered corners in this closeup! I wish you could have seen this in person like we did! I asked Carol if the background fabric was tea-dyed. She said no and had a funny story about it. Apparently they drove quite a way to get the fabric, and when she came out of the store with it her husband remarked, "We drove all this way to buy dirty fabric?" Here is another quilt Carol had finished. I believe she said most of this was hand pieced as well. Look at all those hexies! 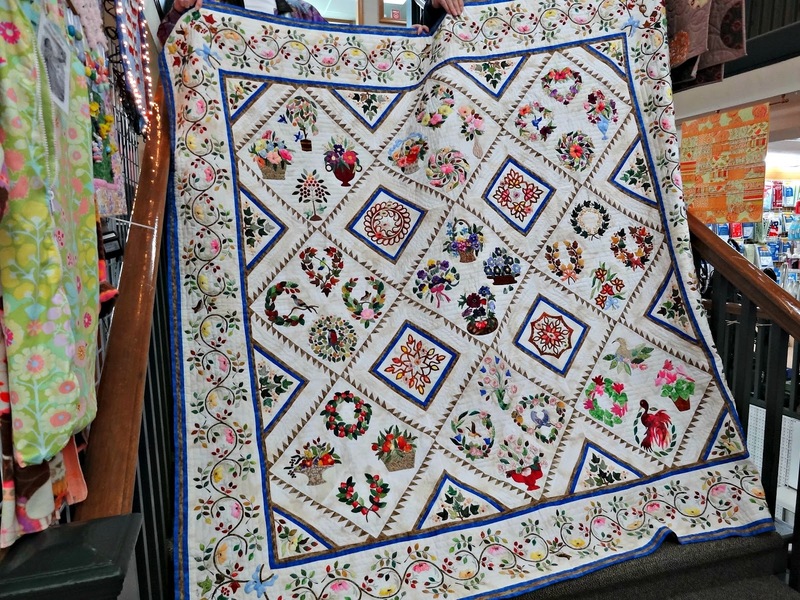 I don't know the name of this pattern but it looks like a Grandmother's Flower Garden. Another view. Carol's husband turned to Mr. Squash and asked how he got roped into going to the quilt shop with me! He replied that he taught me how to fly fish and I fly fish with him, so one hand washes the other! 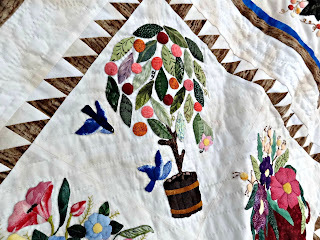 Here's some detail on this quilt. Carol's attention to detail is amazing. You really can't even see her stitches. Thanks so much, Carol, for allowing me to show off your incredible work! I was also pleased to hear that one of the shop gals was a regular reader of my blog! It's always so much fun to stop at Boersma's - we may have to stop on our way home, too! We're in Lincoln City now and plan to drive home on Saturday. I believe my next post will be #400! I might just have to celebrate with a giveaway soon! Candace, thanks so much for sharing these photo's. These quilts are just beyond words exquisite, they are definitely award winning quilts she should be so proud of the as I'm sure she is have a fun, safe trip. All I can really say is...WOW!!! Looks like you guys had an awesome trip! 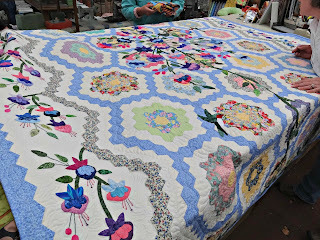 Those quilts are amazing!!!!! Just stunning. 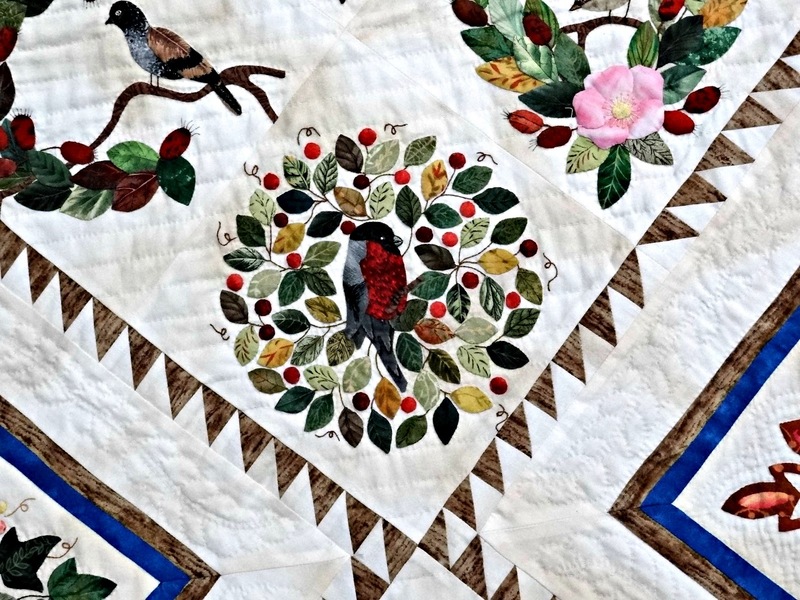 Thank you so much for sharing these stunning quilts with us. They are truly beautiful! I think spring has finally decided to join us! 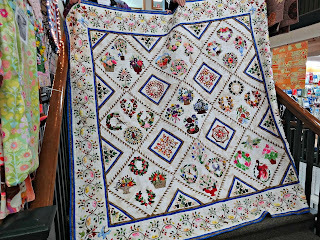 The quilts are just amazing! You must have had a wonderful little trip together. Stunning. Amazing patience to work on something so intricate and for so long. Thank you for sharing and thanks to Carol for allowing you to share with all of us. Happy Trails. Amazing work, I wish I was there to see them close up. I took my LA lessons at Boersma's, what a terrific shop. Enjoy the rest of your trip, you are in heaven on earth at the coast! Oh WOW! stunning work-womanship! 8 years -I can believe it. Amazing! Sounds like you had a lovely trip. wowee!!! those quilts are totally amazing. I really love the grandmothers flower garden. 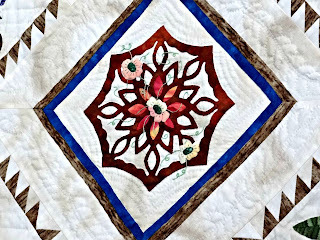 what a great idea to add the applique. Thank you so much for sharing these amazing pictures! Carol's Little Brown Bird is incredibly beautiful! (I'd love to make this one some day) I'm not surprised it took her that many years to complete - it's truly a masterpiece. Wow! What beautiful quilts and what talent Carol has. Thanks for sharing! 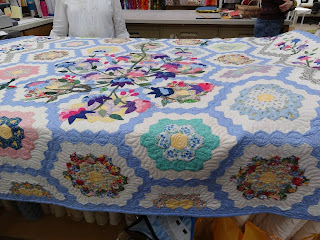 Beautiful quilts, thanks for sharing! Things are Popping up All Over!